Sorry, there are only 5892 tickets of that type still available. Sorry, there are only 5892 tickets left for this event. Help support the programs, events and general operations of the not-for-profit Green-Wood Historic Fund. Even a $5 contribution (and, of course, we're delighted to accept a larger amount as well) provides tremendous assistance to this treasured National Historic Landmark. The Battle of Brooklyn, fought in 1776 on land that is now a part of Green-Wood, was the first battle of the American Revolution to occur after the signing of the Declaration of Independence. Green-Wood hosts a day of commemoration to honor all those who served to defend the young republic. See parades, cannon fire, horses, and re-enactments. This is a great event for kids and families. 10 – 11 AM – TROLLEY TOUR: Join author and historian Barnet Schecter and Green-Wood historian Jeff Richman for a tour of Green-Wood’s Revolutionary War-related sites. This is a separate, ticketed tour, not included in general registration for the commemoration events. Please click here for tickets. 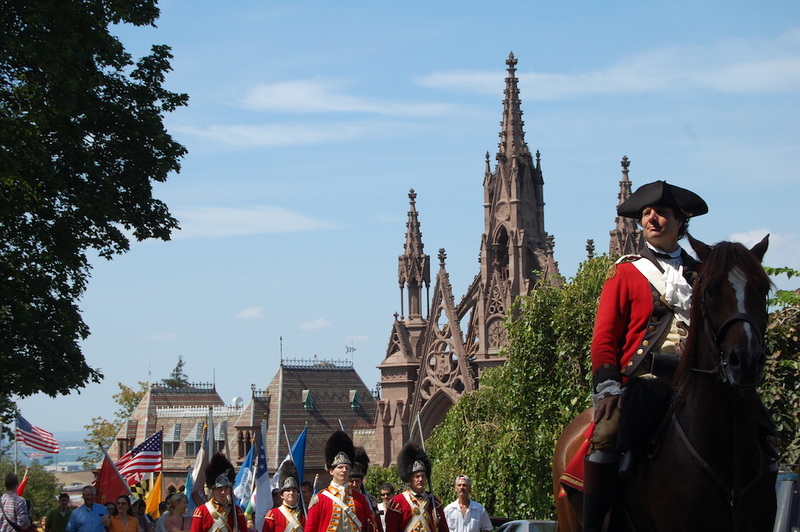 11 AM – LIFE ON THE BATTLEFIELD: Meet soldiers, their horses, and famous colonial Americans. Historic re-enactors will demonstrate revolutionary weapons and tactics. 12:30 PM – BATTLE OF BROOKLYN PARADE: Grab a Revolutionary regiment flag, wave it high, and march to Battle Hill with The Regimental Band of the United States Merchant Marine Academy. 1:15 PM – COMMEMORATION CEREMONY: Honor the spirit and heroes of the Battle of Brooklyn at this commemoration on Battle Hill, overlooking New York Harbor. These events are free, excluding the trolley tour, but please register online so that we can gauge response. We encourage you to consider making an optional donation with your reservation to ensure our ability to continue to offer these events free of charge. Please note: Attendees must stand within the designated viewing areas when the cannons are being fired. The loud noises can cause permanent damage to the ears or even hearing loss.